Two Michelin-starred Chef Tom Kerridge’s cook-wear range is focused on creating products of professional quality. 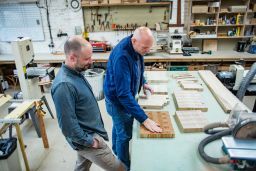 The Tom Kerridge range includes a selection of knives, pans, enamelware, ceramics, wood serving boards and textiles. The products have been designed to stand the tough conditions of a professional kitchen whilst giving your domestic chef beautiful tools to cook and present great dishes at home. Tom worked with British manufacturers, from Sheffield to Shrewsbury, each a specialist in their field, to create a bespoke products especially for the collection.